I love to make my kids’ cakes and see how their eyes light up when they see the finished product. I generally gather several ideas from others that I’ve seen and shoot for simplicity and easy execution. 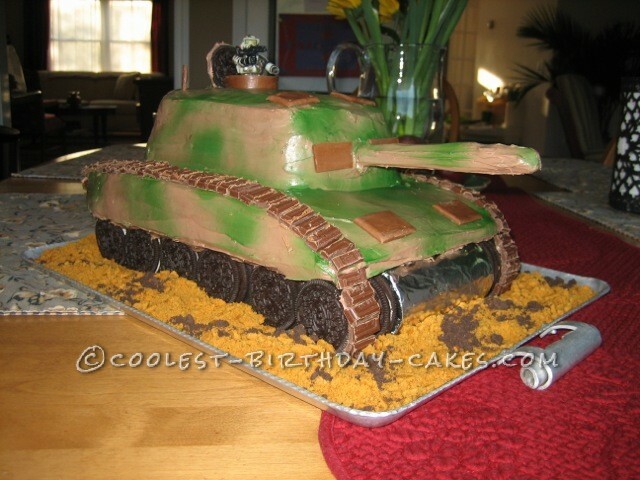 I went for a tank birthday cake. Working up from the bottom, we layered a cereal box covered in aluminum foil fronted with an aluminum-wrapped tomato paste can. On top of that, we added an 11 x 13 sheet cake, then a cake loaf. 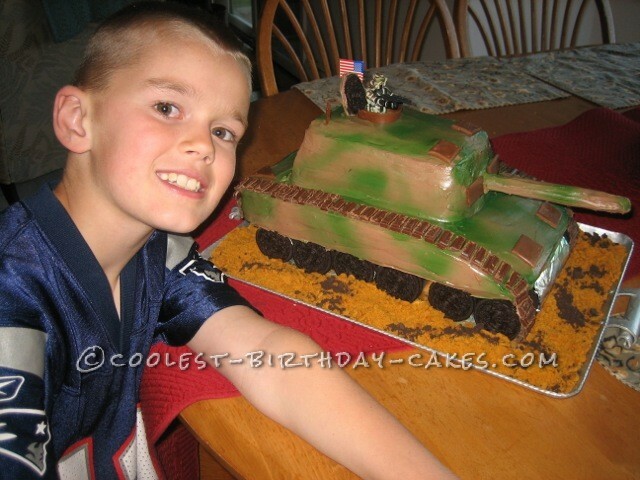 After sculpting the front of the tank, we frosted the entire cake in chocolate icing, and then used green spray food coloring to create the camouflage effect. The wheels are Oreos, the track is assembled with cut chocolate squares and the other “plates” are created by warming and then rolling out tootsie rolls, and cutting them into shape. A frosted pretzel rod created the barrel, and Ethan chose which G.I. Joe figure would have the honor of driving to the party. The “sand” is made from ground graham crackers mixed with brown sugar and dusted with cocoa. 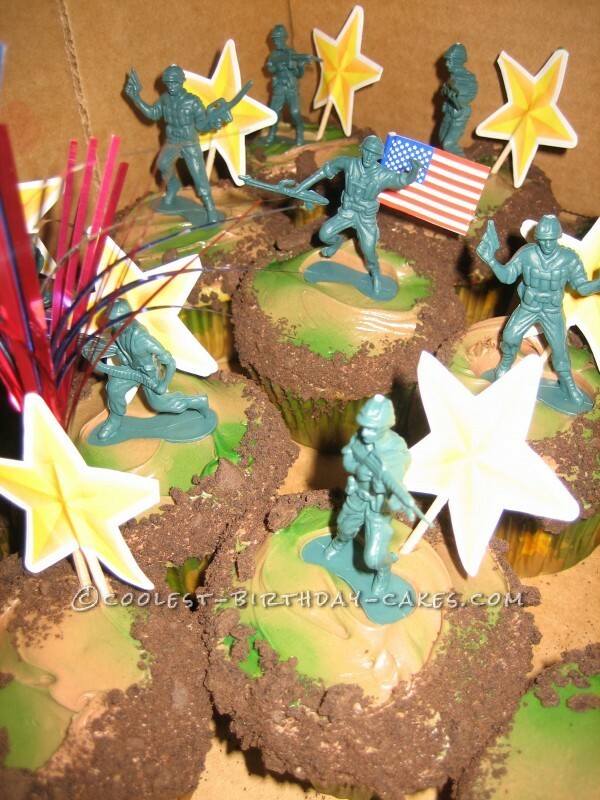 Similar techniques were used to create the cupcakes which were sent into school. 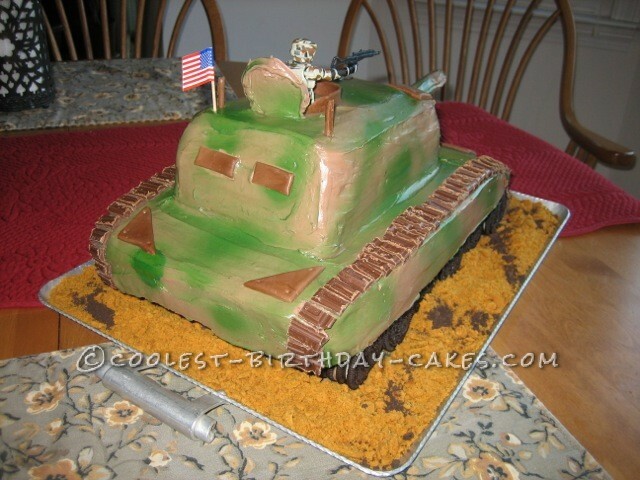 Birthday cake idea Posted by Shannon S.